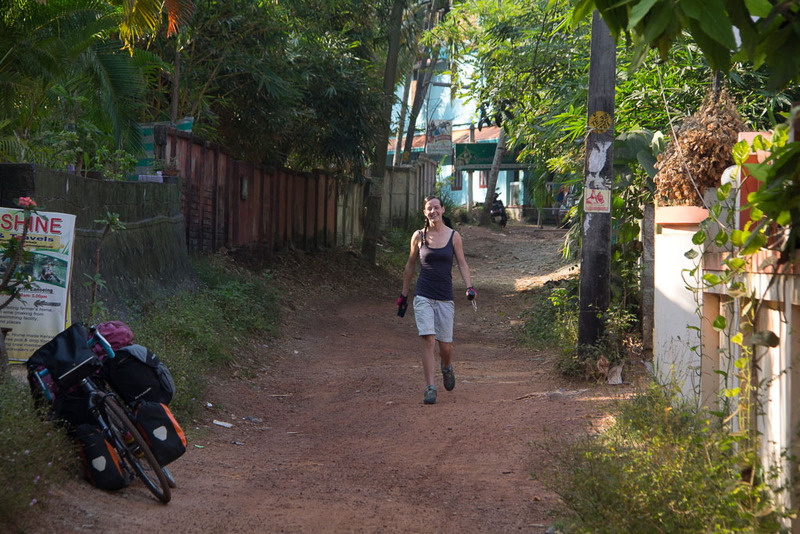 It was flat and only 32 kilometres, but today we broke out of our Varkala bubble and completed our first days cycling in India! Finally we are on the road again, and despite it feeling like we have never cycled before when we set off, it feels good to be doing what we came here to do. We said our goodbyes to the awesome guys at Blue Marine, resisted the extreme temptation of the Royal Enfield Bullet for sale from a really nice English couple and wobbled down the dirt track fully loaded for the first time in almost a month. It didn’t take long before we had reached our furthest explored point, from there on it was new territory! We made it 50 metres before Sheena realised the she had forgotten her phone. According to google maps it wasn’t possible to cycle completely up the coast, a large detour was needed due to a river not being bridged. When we looked at the satellite view there was clearly a small bridge and a road, not knowing if we were able to cross we took the gamble and were successful, shaving 7km or so from the days requirement. The only problem was that the road was unsurfaced and made of large chunks of rock…. The communities we passed through were predominantly Christian and Muslim, being a Sunday the Christians were all enjoying the day off. What do Christian fishermen do on their Sabbath? Get pissed of course, yes the villages were full of drunk fishermen sat in large groups under trees, as we passed they all had an enthusiastic greeting/shout for us. We stopped to admire a collection of large religious pictures depicting St George, St Anthony, Mary and a very girly looking Jesus. 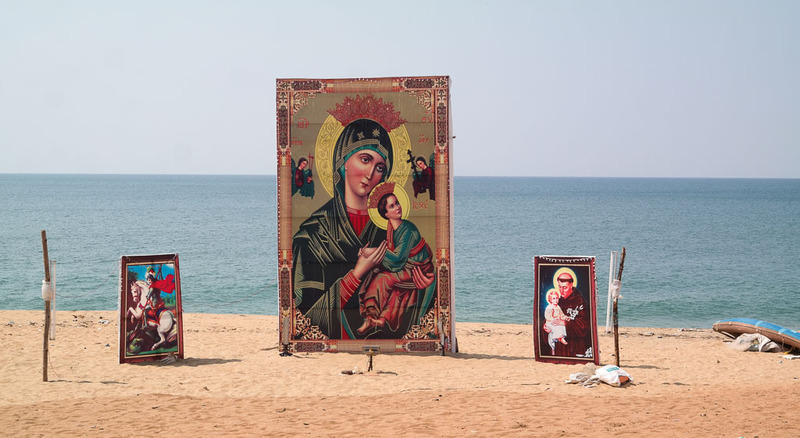 They were large pictures in a kind of Italian Medieval style that looked very out of place on an Indian beach. American Indians, amputees, animals, Brazil, elderly people, harvests, horses, lost articles, mail, mariners, oppressed people, poor people, Portugal, pregnant women, shipwrecks, starvation, sterility, swineherds, Tigua Indians, travel hostesses, travellers, watermen. 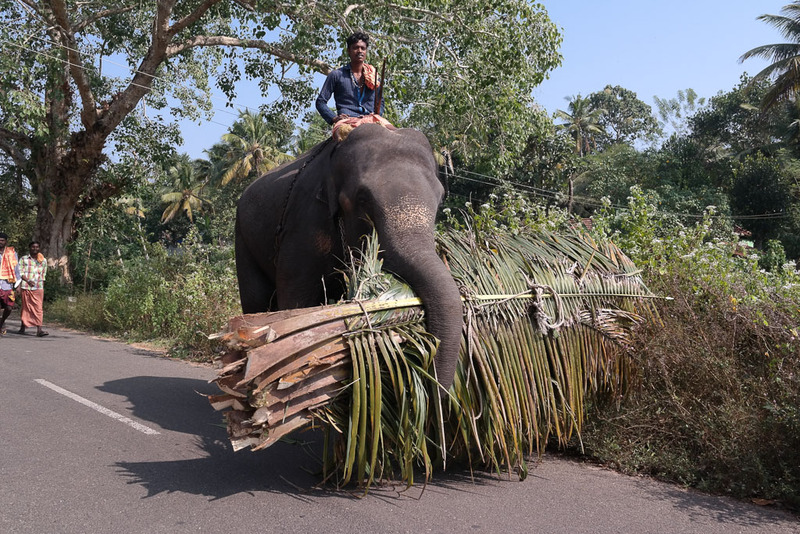 Arriving in town was easier than expected, Kollam has a population of 380,000 so we expected it to be very busy (everyone is at the beach getting drunk?) but the roads were quite quiet and we found a place to stay with no hassle. Our first attempt at accommodation found us at the Government Guest House. These are liberally sprinkled throughout India, cheap, but quite often busy. When we rolled up outside the front door, we hoped against hope that they would have space. The building the guest house occupies is an old colonial behemoth with round roofs, beautiful old doorways leading into high-ceilinged rooms and is painted in simple, understated tones. Unfortunately, it wasn’t to be. The place was full. We have ended up staying at a cheap, clean and brightly painted little place in town that will do us nicely for the night. Most Indian bus journeys are more hair-raising than the rides here! After depositing all our gear in our room, we headed out in search of much needed sustenance. A thali, with unlimited refills for the princely sum of 40p hit the spot nicely and we wandered towards the beach with happily full bellies. 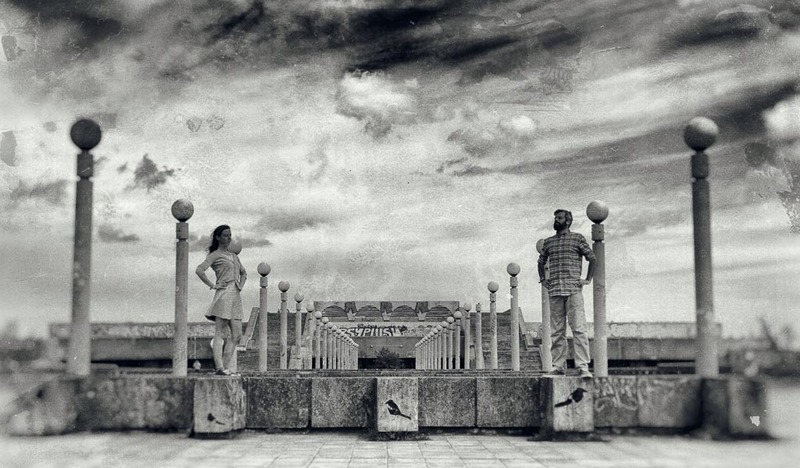 When we got there, it seemed like something was going on. 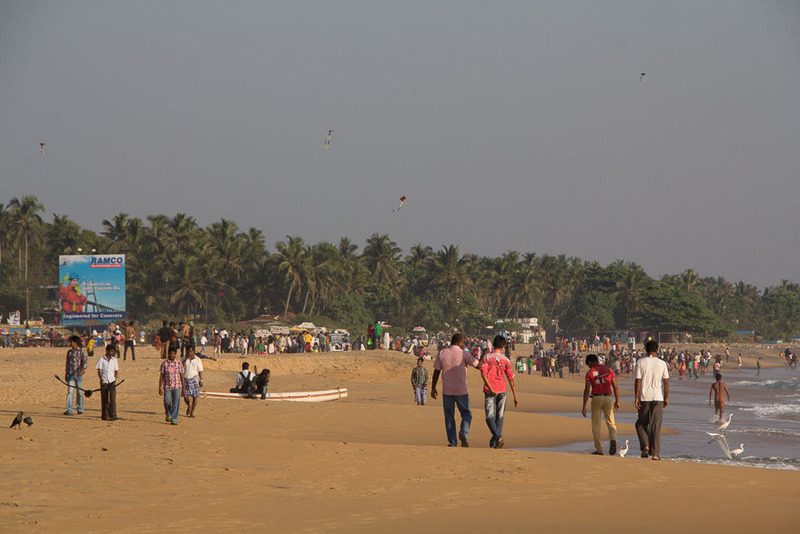 Hoards of Indian people were standing on the beach, seemingly staring out to sea. We squinted and shaded our eyes, but couldn’t spot what was going on. Turns out that’s all they were doing, looking at the sea. Hundreds of them, all dressed in their Sunday best. Getting thirsty, we headed towards a small park. 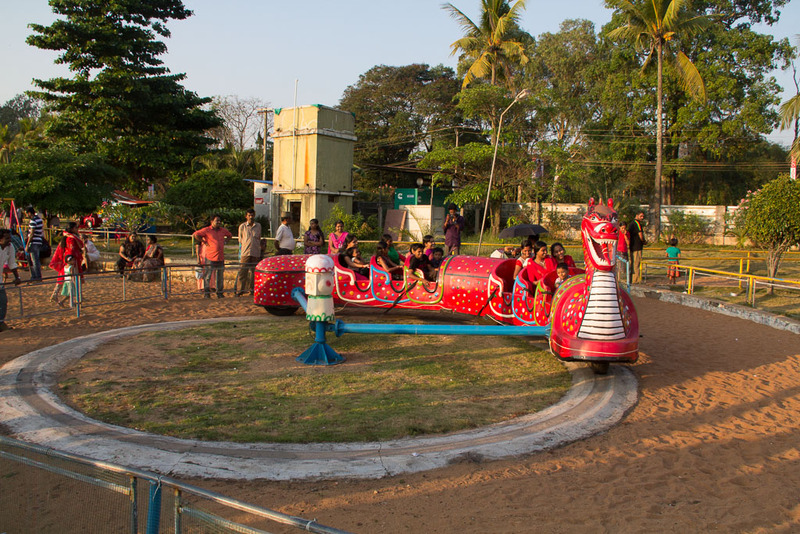 It was full of amusements for kids and adults and entrance was 5 rupees. When we went to pay, the man at the desk waved us away, telling us we were guests and that it would be free! Cool! So in we headed. It was possibly the strangest mish mash of rides and amusements I have ever seen. You could play one inning of cricket against one of those machines that shoots out tennis balls, there was a roller coasterish thing that simply went round in a tiny circle for 10 minutes, and you could rent a swan pedalo that you could glide up and down a 20 metre long filthy canal in. The most fun was just watching all of this take place though and we settled with a cold drink to watch everyone enjoy the madness of it all. 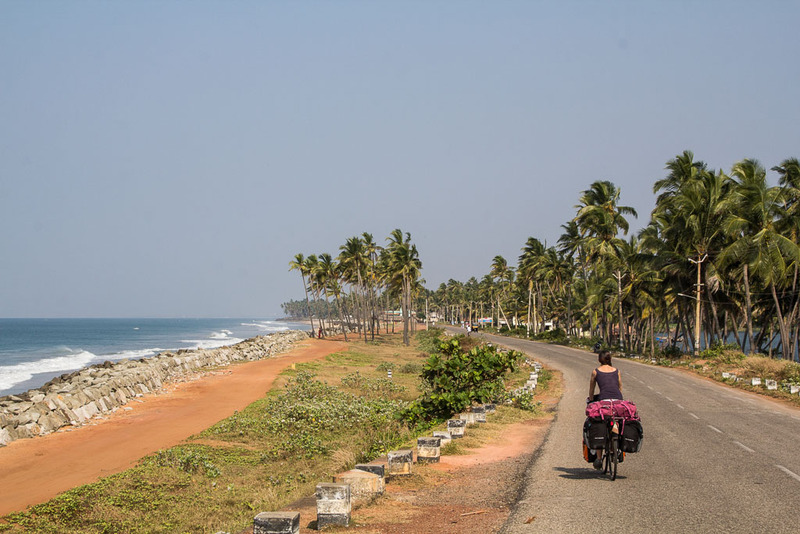 Our first day on the road has been in stark contrast to the safe familiarity of Varkala, but it’s been brilliant to see new places and experience India proper. 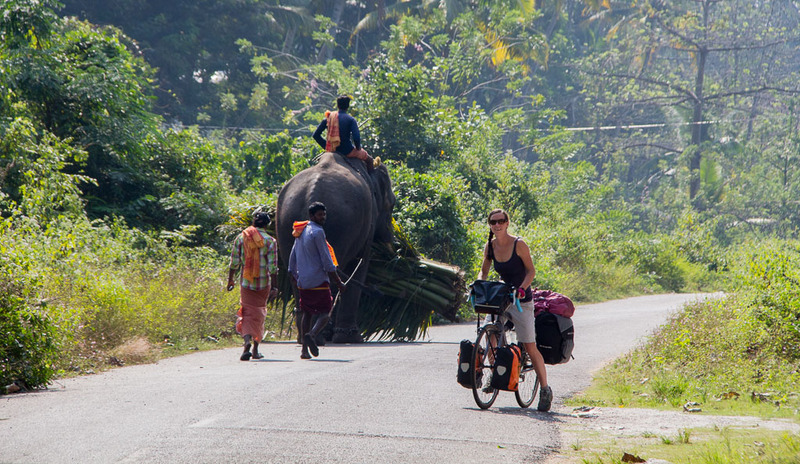 So, the first day: Quiet roads, elephant sighting.